When I hit the Declutter Road last week, I never expected laughter, gasps, and heart tugs. This roller coaster ride of emotions arrived after I found a single piece of paper beneath a six‐inch pile of old memories. It’s my first‐ever school progress report, dated October, 1963. I quickly realized the sheet offered more than a single snapshot of a student’s education. Cultural and societal commentary screamed here, too. All courtesy of Mrs. Esther Ruth Gibson, my first grade teacher at Sam Houston Elementary School in Pampa, Texas. She was “Esther Ruth.” Never simply “Esther.” It’s a double‐name Texas thing. However, to me, she was always Mrs. Gibson. That’s small town Texas. When Webster’s Dictionary defined ‘teacher,’ this woman modeled. She mentioned a “Readiness Program.” My mind flashed forward to Common Core, No Pass/No Play, and similar education reform efforts. The more things change, the more they remain the same? 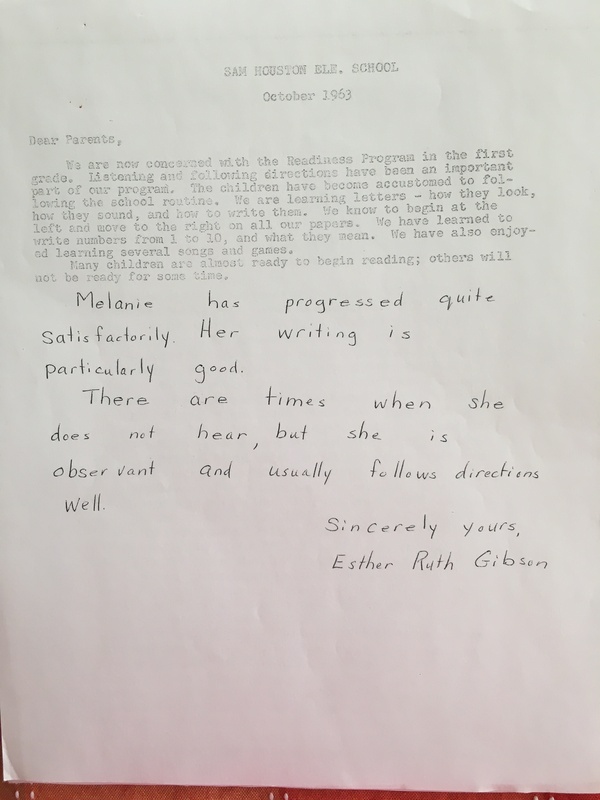 Below the standard progress report, Mrs. Gibson added two paragraphs of professional educator observation. Offered in teacher‐perfect penmanship. She nailed me at age six. That comment about things staying the same? Mrs. Gibson identified elements of me that remain true 56 years later. My writer self would like to believe that sentence was both prescient and true. Then. And now. I’d also like to believe she would be proud of this blog. 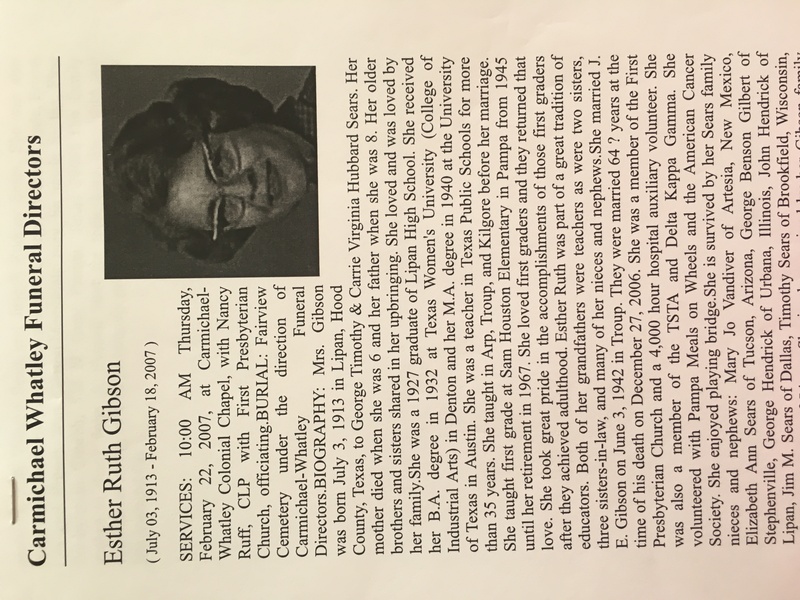 After discovering Mrs. Gibson’s letter, I looked her up on‐line. I learned she died a dozen years ago. The same age Mrs. Gibson was the year she taught me.